Challenging a Toyota product has been a nightmare for most of the auto makers around the globe for decades if not centuries. But the year 2004 had a huge surprise for everyone in the name of Chevrolet Tavera. It outclassed the Toyota Qualis and the Mahindra Scorpio in a series of road tests conducted by various portal and automobile pundits. If you are mulling to own a MUV with lots of space, decent handling and ride quality and the one which is competent to take your entire family for an outing plus their luggage, the Chevrolet Tavera is what you should be looking for. Chevrolet Tavera is a reliable and well-engineered product. Both the rows offer good leg room and head room and the cabin is spacious as well. The engine is free of complicated internals and is trouble free. Although a few early variants had a leakage problem, it was rectified in the subsequent models. Better check for this around the cylinder head and engine seals. As a thumb rule you must stay away from such vehicles as your wallet may take a severe hit. Gearbox bushes of the Tavera are very prone to wear, they may wear out even as early just 20,000 km. so now you know where to look for trouble if you have difficulty in slotting gears. Front tyres wearing out prematurely are also a cause of worry in some used Chevrolet Tavera. This is profound on cars that are plied either on bad roads or are genuinely been driven badly. Many cars have reported a failed fuel pump, considering its replacment cost of Rs 6,500, is an expensive affair. Second hand Chevrolet Tavera has known electrical issues, so have an eye on them as well. Run the power windows and go through the fuse box for replaced fuses, which are not of great concern but surely are irritating the most. One should never miss the cardinal rule of checking the shape of the drive shaft. Head lamp reflectors are other costly item at Rs 2,600 each, something to look out for. Generally a Tavera has fine paint quality, quite good build quality overall and the body is rust-proof. Common items that needs to be replaced while buying a used Chevrolet Tavera like oil and air filter are also expensive, than most MUV’s in its class. It’s advised to be aware that the running cost a second hand Chevrolet Tavera is definitely more than a Sumo or a Scorpio. A year and a half used Chevrolet Tavera price would be around Rs 5, 50,000. So, if you get an opportunity to lay your hands on such a model, look for a car which comes with original warranty. Prospective used Chevrolet Tavera buyer must desist from buying the car from unofficial car market. There is a merit in this move. 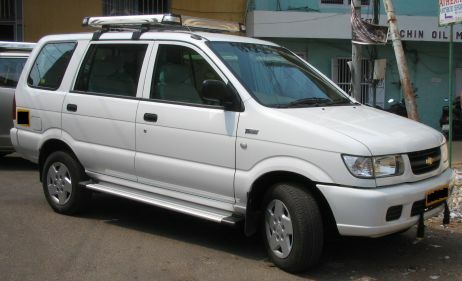 It is widely known that due to early pull-out of Toyota Qualis, taxi-fleet owners used Tavera as taxis for inter-city transport. Now, these cars are been sold through the network of second hand dealers. It’s true that the price offered by a second-hand car dealer may be tempting sometimes but there is a high possibility that the car that is being offered to you has been through a hell lot of ups and downs on the road. And also it may be just a cosmetically refurbished piece. The average service lifespan of the tyres is generally around 40,000 km, so if you find the tyres all worn-out and at the same time the odometer is registering 20,000 km, there is something fishy, more than what meets the eye. A better place to get hold of a used Chevrolet Tavera is definitely with a private seller or at an authorized GM dealership. Here cars those are exchanged by previous owners are up for grabs. The chances of getting lucky at a certified second-hand dealership are manifold, as they offer warranty packages and free servicing. 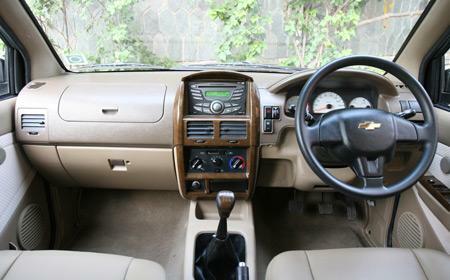 Summing it up, the Chevrolet Tavera has got strengths at all the right places decent interior, handling and good ride. Although it’s true that the Tavera is not as aesthetic as you might want it to be vis-à-vis other MUV’s of its class still, the Tavera is a good buy which combines good value, practicality and space.